Chicken and dumplings, comfort food for the soul and body. The weather has drastically changed from last week’s sunny and balmy temperatures in the 60s, to this week’s freezing rain, drizzle and even a few flakes. Time for some comfort food. When I have asked my sons, both now grown, what their favorite childhood food was, they both say that it was my chicken and dumplings. My brother and I both agreed that it was the most requested meal we would request of our grandmother, too. Some things never change. So I made a big pot of chicken and dumplings this week. Now if you even have one toe in the South, you know that by dumplings, I do not mean those fluffy dumplings. Those are for beef stew. The kind of dumplings I’m talking about are “slick” dumplings, or flat dumplings. These are akin to a homemade noodles. So what follows is my grandmother’s recipe as taught to me; nothing is written down. Three chicken thigh and leg quarters (or equivalent). Dark meat is more flavorful. Bring to a boil and simmer for about an hour and a half until the meat is falling off the bone. Drain through a colander into another pot and place pot of broth back onto the stove. Add about two teaspoons of salt, a few shakes of garlic powder, some coarse ground black pepper, a pinch or two of parsley flakes. I usually add a couple of chicken bouillon cubes for more chickeny flavor but that is a personal choice. Bring pot of broth back to simmer. While the cooked chicken is in the colander, you’ll want to move it around with a large spoon to let it cool. Then debone the chicken. You’ll end up with a large plateful of chicken. Cut up some of the larger chunks but don’t shred it too much. Meanwhile, as the chicken is cooking, you’ll want to make the dumplings. Frankly, this is about the same recipe as homemade pie dough. Ingredient measurements are not exact but you’ll get the feel of it. When the shortening is cut into the flour and it looks kind of granulated or like crumbs, then you add ice water. You drizzle it in little by little and fluff it with a fork. This will be about ¼ to 1/3 cup. It is not an exact measurement but don’t add too much or your dough will get sticky which will make heavy dumplings. Bring it into a ball but don’t handle it too much. Put it in the refrigerator to rest. Cool dough is easier to roll out. About 15 minutes before your chicken is done, take the dough out of the fridge and roll it very thin, about 1/8 inch. Then cut the dumplings into squares about 1 to 1 ½ inch in size. You can use a sharp knife but I find a pizza cutter works much faster. After you have brought the seasoned broth back to a boil, add the cut dumplings into the simmering broth, a handful at a time. Stir a bit to keep them from clumping together but they’ll rise to the top when cooked. Then add the deboned and cut up chicken back to the pot and again simmer. The dumplings will usually thicken the broth but you can always use a little cornstarch and water to thicken it. Or if you need to thin it, add some more chicken broth or water. I know this sounds like a lot of work but it’s definitely worth it and perfect for a cold, winter day. Let’s just see if your family adds this to the favorites list. Enjoy! 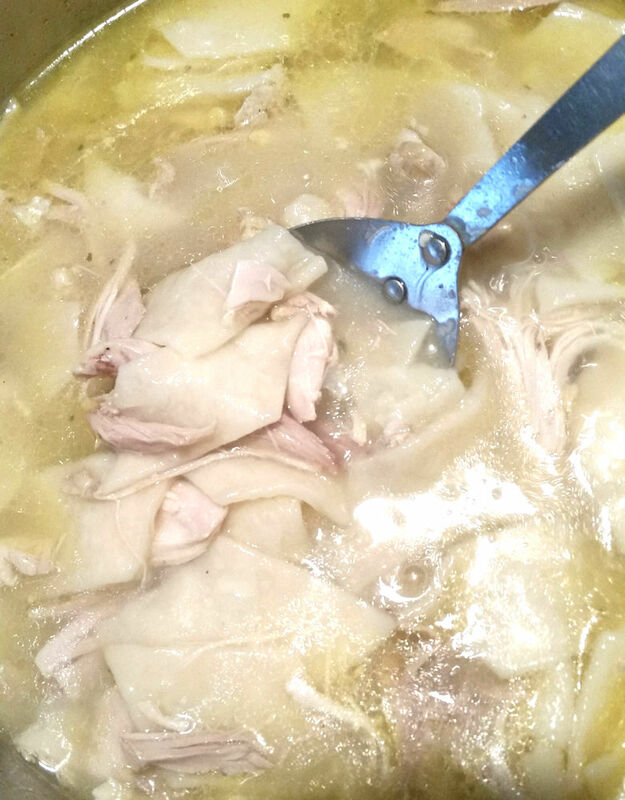 This entry was posted in country living, recipe and tagged chicken and dumplings, cold weather food, comfort food, family recipe. Bookmark the permalink.